Rapid Intake (http://www.rapidintake.com/) that is the leader in collaborative eLearning development and review won one of the e-learning industry's most prestigious awards the 2008 Brandon Hall Gold Award for Best Innovation in Learning Technology. "From the moment we began designing the software and choosing our underlying technology, we set out to offer the e-learning community a ground-breaking solution," said Garin Hess, CEO. "It's great to have that achievement by our team recognized formally like this." The Brandon Hall Excellence in Learning Awards are presented annually by Brandon Hall Research. This fourteenth year, a total of 246 entries were submitted from several different categories. "We are so impressed with the quality of this year's winning entries," said Brandon Hall, Ph.D., chairman of the Awards program. "These winners set the standard for what innovative learning looks like today." Unison presents a web-based solution itself, through this instructional designers and subject matter experts (SMEs) log in through any major browser and collaboratively capture, storyboard, develop, review, test, and publish courses that output in native Flash and XML. 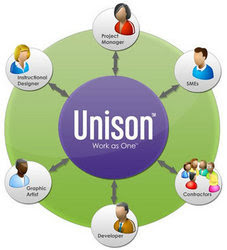 According to the PRWEB, Unison’s connectivity is inherently part of a browser-based authoring environment by facilitating real-time collaboration among instructional designers, subject matter experts, and other project participants. The contest judge admits that: "This tool is very compelling. It offers collaboration and instructional development features ... not seen in other similar tools." Also Rapid Intake has the licensing model. It encourages collaboration by offering licensing levels that include unlimited users for a flat annual subscription fee. "Most software licensing models discourage collaboration because every time you want to add another user, you have to pay for another license," says Steve Hancock, President. "We have affordable licensing levels that give our customers unlimited users, so they never have to worry about adding additional people to the project." One contest judge reported, "The flexible licensing options for this tool would make it accessible to many organizations." According to the Rapid Intake report Unison has more than 2000 users. They created 2,138 projects. As it is mentioned in the PRWEB, among the current users are: T-Mobile, Costco, Baker Hughes, PetSmart, Brigham Young University, The College Network, General Physics, and MGMA.